Destruction racing at it's most extreme; the enhanced Crash True™ game engine increases the interaction between cars and environments to set up the wildest crashes ever seen in a game. The peerless physics create an astonishing driving feel with the sheer fun of causing chaos all around. And FlatOut 2 gives even more rewards to cause as much damage as possible to compete against rivals. The reckless Rag Doll stunts will be back with a more advanced scoring system and an improved launch mechanic. Experience hours of bone-breaking fun, this time featuring 12 all new crazy events to punish your driver in the expanded Rag Doll Championship and online Rag Doll play. Get ready for no holds barred racing games with even more tracks, cars, with more rad doll games and a lot of city and country settings. 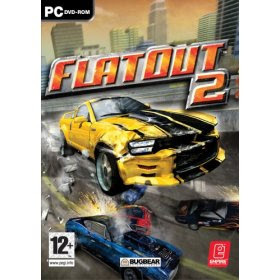 The car racing game Flatout 2 offers the most mind blowing crashes ever!! If action games are your thing then check the md action games and demo action games .